To suggest there are only five things to do in Dubai would be a blunder. This extravagant city has so much to offer, which makes selecting a sightseeing itinerary difficult. Dubai is famous for incredible manmade landmarks like the world’s tallest building and the picturesque Palm Islands. But there’s much more to this destination than flash. It takes time to uncover the real Dubai, to get beneath the surface and experience the city as a local would. That’s why we spend more time in port. Our Fall 2016 Le Club Voyage cruise begins and ends with an overnight stay in Dubai. That means guests will have four days to explore this dynamic destination while enjoying the tranquil accommodations of the newly reimagined Azamara Journey. These tips on exploring Dubai will help you plan your time in this futuristic wonderland. 1. Gaze up at – or down from – towering skyscrapers. Burj is the Arabic word for tower, and Dubai has several of them. Its impressive skyline features some of the tallest and most iconic buildings in the world. 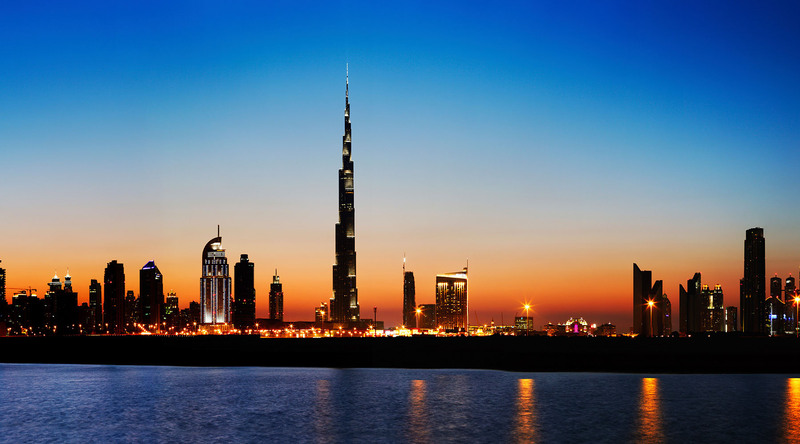 Burj Khalifa, at 2,722 feet, is the tallest structure in the world. Its observation deck offers stunning views of the surrounding area and is not to be missed. Nearby to Burj Khalifa you’ll find the beautiful Dubai Fountain, gardens, a restaurant (the highest in the world, naturally) and more. Burj al Arab is found on a manmade island and is sometimes called “the world’s only 7-Star hotel” – although technically, there’s no rating higher than five. Experience the ultimate in luxury for yourself when you visit the hotel during our “Cosmopolitan Dubai and High Tea” Azamara Shore Excursions tour, available on the Le Club Voyage cruise. 2. Go wild for wildlife. When you think of Dubai, the word “nature” may not immediately come to mind. However, from desert safaris to underwater zoos, there are plenty of ways to explore the animal kingdom. The Dubai Desert Conservation Reserve is the most carefully preserved wildlife area in the United Arab Emirates. Here, you can go for a camel ride or see native animals like gazelles and orxy during a Range Rover tour. History buffs might enjoy learning about the centuries-old tradition of falconry. Long ago, trained falcons were used to catch prey like hares and birds, to supplement the Bedouin diet with meat. Today, the practice is an important part of Arab culture. The Dubai Aquarium and Underwater Zoo is at the Dubai Mall. This aquarium is more than just a few fish in a tank. They offer scuba diving, cage snorkeling, close encounters with sharks, and more. 3. Shop to your heart’s content. The Dubai Mall is home to 1,200 shops and is the largest mall in the world by total area. Are you sensing a trend? Everything in Dubai is the biggest, the tallest, and the first of its kind! The Dubai Mall hosts the aquarium, as well as an ice-skating rink, theme park, and more. This souk is not exactly a traditional Arab market, but more of a luxury boutique mall. It’s touristy, but worth a visit – especially if you’re picking up souvenirs for yourself, or friends and family back home. This new open-air shopping mecca has more to offer than just boutiques. This trendy addition to the Jumeirah neighborhood is also a great spot for art lovers. It just debuted Dubai Walls, a street art exhibition featuring fifteen works of art from renowned urban artists around the world. This lavish complex with an Ancient Egyptian theme has a mall, a hotel, residential buildings, restaurants, and so much more. You’ll come for the shopping, but stay for the architecture. This souk, nestled between the Wafi City mall and the Raffles Hotel, is said to be modeled after the famous fourteenth-century Khan Murjan Souk of Baghdad. Shopping here can be pricey, but the lavish, detailed design makes it worth a visit. This 600-store mall is most famous as the home to Ski Dubai, the Middle East’s first indoor ski resort. The modern-looking Souk al Bahar is found in downtown Dubai, and is included as a stop on our “Wonders of Dubai With Visit To The Top” Cruise Global, Connect Local shore excursions tour. Whether you’re hoping to buy a glittering souvenir or not, a visit to the Gold Souk is a must while in Dubai. The government’s tight control over the quality of merchandise offered from over 300 retailers at the Souk means you can feel confident about the authenticity of your purchases. The Gold Souk is found on the south bank of the Dubai Creek, and the Spice Souk can be found just across the water. The Spice Souk will be of particular interest to foodies and home chefs – you’ll find everything from spices and herbs to incense and medicinal products. Stock up on saffron, as it’s much less expensive in Dubai than North America. Fashionistas will adore the variety of colorful fabrics available at Dubai’s textile souk, also located along the Dubai Creek. The selection of raw silk, printed cotton, delicate lace, and other material is seemingly endless. This well-preserved traditional market is also one of the most beautiful in Dubai. For thrill-seeking travelers, there are plenty of options in Dubai. The city is an adventure wonderland – think indoor skiing, lightning-fast roller coasters, massive water parks, and desert off-roading. Adrenaline junkies should try skydiving – just imagine soaring over the picturesque Palm Islands! Or, go zip-lining over Downtown Dubai, beginning at a perch 90 meters high off the W1 Tower. If those options sound a little too daring, consider our Cruise Global, Connect Local shore excursions Dubai Seaplane Aerial Tour. It's available on our Le Club Voyage cruise this fall. You’ll glide over Dubai’s iconic skyline and skim across the glittering bay waters. Now that's an adventure worth writing home about! Speaking of water, Dubai is home to several stunning beaches. The crystal clear waters of the Arabian Gulf are great for kayaking, surfing, snorkeling, and more. Or, simply stretch out on a lounge chair and watch the adventure unfold before your eyes. For a more leisurely outdoor experience, play the renowned Majilis Course at the Emirates Golf Course. The impressive layout has been carved through the desert. The winding, narrow fairways will keep you on your toes throughout the challenging 18 holes. Azamara’s partnership with PerryGolf makes teeing off along the Arabian Gulf a breeze – all you have to think about are your shots. Our Le Club Voyage cruise debarks in Dubai on November 3, just in time for the annual opening of the popular Global Village. This entertainment and cultural festival features street performers, fireworks displays, thrill rides, and a variety of international dining options. Dubai is a world-class city with international influences, and nowhere is this more apparent than at the Global Village. 5. Immerse yourself in local culture. There’s more to Dubai than skyscrapers and shopping. Travelers looking to expand their horizons and learn more about Emirati culture will find a treasure trove of art galleries, museums, and religious sites to explore. The Dubai Museum is the city’s main museum and it resides in the city’s oldest building – the Al Fahidi Fort, built in 1787. The exhibits showcase the area’s transformation from a fishing village to the cosmopolitan metropolis it is today. The Jumeirah Mosque in downtown Dubai is one of the city’s most beautiful landmarks. It’s also the only mosque in Dubai that welcomes non-Muslim guests. Tours are offered six days a week by the Sheikh Mohammed Centre for Cultural Understanding. Islam is the official religion of Dubai, but other religions are represented as well. The beautiful Gurunanak Darbar Sikh Temple serves over 10,000 Sikh worshippers, while the Shiva and Krishna Mandir temple complex is a place of worship for the city’s notable Hindu community. The nearby “Hindi Lane” is a vibrant alley where vendors sell religious knickknacks and temple offerings. The Al Fahidi Historic District of Dubai, formerly known as the Bastakia Quarter, is a labyrinth of beautifully restored buildings hosting art galleries, museums, cafes, craft shops, and more. It’s a great place to explore Dubai’s artistic side. Another way to embrace Emirati culture is through food. Our Cruise Global, Meet Local Farmhouse Experience tour will give you an inside look at the day-to-day life of a rural family. You’ll learn about what vegetables the farm produces, as well as breeding camels and Arabian goats. A family member will lead a cooking class and prepare classic Emirati dishes for you to sample. There’s no better way to truly get to know a travel destination than by connecting with local life. Dubai truly is one of the most interesting cities in the world, and there’s no better way to explore it than with a travel company that’s focused on the idea of “Destination Immersion”. Browse all upcoming voyages calling on Dubai.